For such a complex, impressive, beautiful piece of work, the pouch is attached to the bandolier in a very haphazard manner. The upper corners of the pouch are sewn to the back of the bandolier with a whipstitch at each corner. 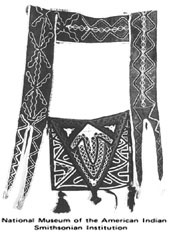 The exact area of attachment to the bandolier varies slightly, but generally is at or just above the "valley" between the first two outer fingers. Yes, this is a flimsy arrangement, considering all the work that has gone into the project up to this point. For that reason, it's not at all unusual to find museum examples that have been separated at this point. But, that's the way it was done. The pouch and bandolier is a beautiful piece of Southeastern Native American culture. I encourage you to visit the museums in Gainesville and Miami, along with the Smithsonian, the Museum of the American Indian (New York), the Denver Art Museum, and the Denver Museum of Natural History. Study o£ pictures is very worthwhile. 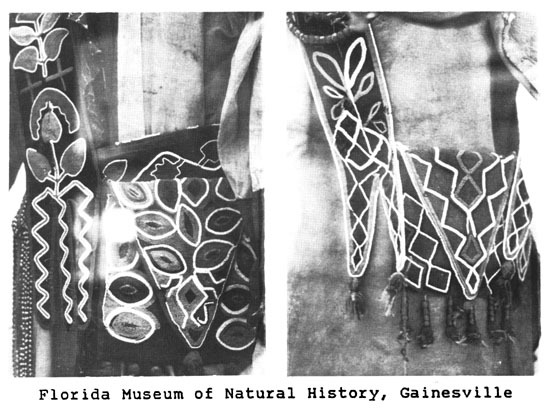 In this way, you can get a feel for the design and color schemes of the pouches and bandoliers of the 19th century Seminole.